Cat's Walks: No! No! No! Abs-cbnnews.com reported today that business groups are backing a moratorium to revise Boracay's "masterplan so that it would become a high-end tourist destination, with Aklan providing the low-cost accommodations and Carabao Island hosting the casino operations".This should also allow Boracay to reach an annual target of 5 million tourists. Samie Lim, president of the Philippine Chamber of Commerce and Industry (PCCI), said that a ferry system should be established "to allow the so-called “backpackers” and mass tourists to get off the island at night and then stay in cheap rooms in Aklan where they will clean up and “throw away everything.” According to him with this system “They will be able to get the best of worlds. 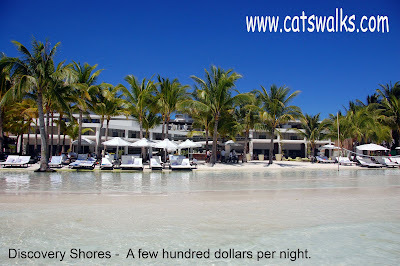 They can stay in cheap hotels in Aklan and then go to the white-sand beaches in Boracay in the morning.” This will then allow Boracay to be exclusive to hotels with room rates at $200 to $1,000 per night. Lim added that "the moratorium on developments in the island should remain until the national government and the local units there have firmed up strategies on how to address issues like sewage system and the other facilities"
This wonderful idea was conceived after the Department of Environment and Natural Resources (DENR) under Lito Atienza ordered a stop to all construction activities in Boracay because of the continuing environmental degradation due to unchecked construction activities. Rich businessmen who are obviously selfish, profit oriented and have no clear notion of reality then had to figure out a way to build in Boracay despite the construction ban. Of course, they would come up with another brilliant idea to lay the blame on the public on a budget and to segregate the rich and the poor. Maximizing the benefits of those who can pay. 1. It is the big multi-billion peso investments that are the most harmful to the environment. Imagine constructing a golf course on a water-starved island; Imagine cutting the forest (source of water) to build condominiums; Imagine replacing wonderful fresh low-key nipa huts with monstrous 200-room concrete structures without any architecture. Actually, no, you don't need to use your imagination because these stupidities have been done in Boracay. Then big investors want the backpackers to move to Aklan! So, the big businessmen can build more golf courses and cut more forests? 2. I can barely afford nor would I go to a hotel with a room rate $200 per night and I am earning more that the average Filipino. In a country where a lot of people are below the poverty line, would it be decent to make one of the most beautiful places in the Philippines, one the all Filipinos should see (rich or poor) that expensive. Now, there is something for all budgets and it is the system that should stay. 3. A target of 5 million tourists annually? Boracay is so small. How can it support that many people? If you put too much people inside it will sink. Maybe people should decrease the target then the environmental degradation will stop. 4. What is wrong with being a "so called backpacker" (as Lim puts it). Majority of tourist are backpackers. Not everyone can afford to be a luxury tourist. Backpackers are actually the ones who "discovered" Boracay in the first place. They are also the ones who travel to appreciate the culture of the country they are visiting and not only to lie in the sun. 5. The non-multi billion peso resorts in Boracay who are catering to backpackers and budget-minded tourists can and should be forced to comply with sewage and drainage rules. Authorities should develop and implement these rules after developing a functioning drainage and sewage system. I applaud Lito Atienza for having the guts to stop multi-billion projects to save Boracay from environmental disaster. That must have been really ugly for him, I can imagine. I am happy that rich businessmen agrees that Boracay needs saving. At least everyone agrees that Boracay's Masterplan should be changed. People should just keep in mind that greed won't save the Philippine's piece of paradise and that should the masterplan be changed, it should be changed that with sustainability and not profit in mind. coming up with masterplan to save boracay is a great idea, but disallowing backpackers or not-so-rich vacationers from fully enjoying this pristine paradise is discrimation beyond the word discrimation. cmon guys, you can do better than that!